I know...it's been a while! We meant to be here, telling you all about our great discoveries, but sometimes life just gets in the way. Between the three of us, we've had illnesses, a job change, a move, a graduating senior, cross country and track meets...you know...LIFE! So, the blog was one of the things that just got put on the back burner. We are still having trouble working in an excursion, so I thought I would catch you up on some of the things we have done, but failed to talk about. The rest of the backyard. First, we did manage a little trip down the road to Barry's BBQ in Fyffe, AL. For those unfamiliar with the backroads of Northeast Alabama, Fyffe is in Dekalb County high atop Sand Mountain. Fyffe is also known for its UFO sightings. On February 11 and 12, 1989, more than fifty residents of Fyffe called to report sightings of strange banana shaped lights in the sky. There was never any explanation given for the lights that people saw in the night sky on those two dates, but two certain things did come of the sightings. First, the state legislature officially declared Fyffe to be the UFO capital of Alabama and second, the city now celebrates the sightings every year with UFO (Unforgettable Family Outing) Festival Days complete with hot air balloons and live music. Now, the friends did not make it to the UFO Festival, but we did manage to bebop on down to Barry's Backyard BBQ and we also managed to talk my niece, Haley, into joining us. Ask anyone in Fyffe where to find Barry's BBQ and they will likely tell you it is in Barry's backyard. So it is! Barry's is an unpretentious white concrete block building with unpretentious styrofoam plates and cups and plastic forks. The tables are fully equipped with rolls of paper towels. But don't let the unpretentiousness fool you. Barry is serious about barbeque! We went on buffet night and we had our choice of barbeque (of course), fried catfish, or fried chicken. Along with the three meat choices, the sides included barbeque baked beans, pinto beans, turnip greens, creamy coleslaw, potato salad, hushpuppies and cornbread. For dessert, our choices were homemade ice cream, peach cobbler or peach cobbler with homemade ice cream. Sherri, Lu and I went for the catfish. If you sense a pattern here, I admit it. If there is a choice between freshwater fish or seafood or any thing else, I'm going for the stuff that lives in the water! Sherri and Lu added on the barbeque pork as well. Haley went for the fried chicken. I had the barbeque baked beans, creamy coleslaw, turnip greens and hushpuppies. Luanne added on pinto beans, hushpuppies and cornbread. You KNOW she wasn't going to touch the coleslaw or potato salad! Sherri got potato salad, turnip greens, coleslaw and pinto beans. Haley went for the potato salad, turnip greens and cornbread. No matter what the combination, we all enjoyed every bit! Everywhere we go, Lu runs into someone she knows. Well, we all ran into people we know! Two of my favorite people in the world right here, Pat and Bill Freeman, enjoying Barry's with friends of theirs. As we left Barry's, full and happy, Sherri, true to form found some friends of the four legged variety! And driving off, we took a little detour to find another Dekalb County spot we've heard lots about, Bucks Pocket Steakhouse. I promise, if I had to find either of these places again on my own, I could not do it! Of course we were too full from our meal at Barry's even think of having anything at Bucks Pocket, but we did check out the menu for a future excursion. Three Friends and a Fork give Barry's BBQ Three YUM's UP! 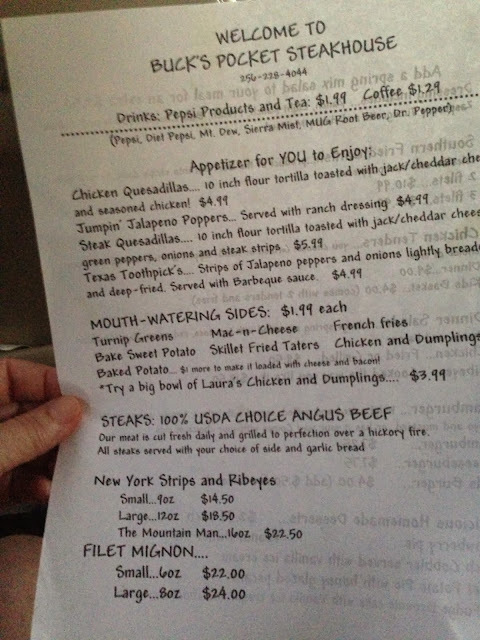 The menu from Bucks Pocket Steakhouse....We'll check it out one day!